On the outskirts of Middletown, not far from the reservoir, the Pres put on his indicator, pulled over on the side of the road and blurted, "#*&^%@$...the truck is overheating!" Sure enough, when he opened the hood of his Diesel, the smoke wafted upwards, although it was minimal. Thank goodness that he noticed the gauge immediately! 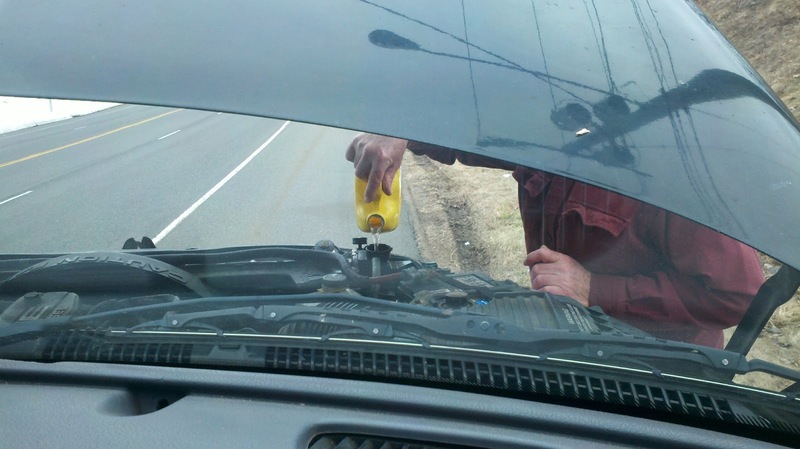 Repeatedly turning the cap on the radiator to release the pressure and the overheated liquid, he waited patiently. I was glad that it didn't take long for the anti-freeze solution to settle down. Reaching into the back seat, he grabbed a plastic Prestone container and muttered, "I don't think there's enough water in here. I forgot to fill it." Apparently, what I thought was an empty jug lying on the floor all these years is filled with water for emergencies such as this!! While my mind muttered the dreaded Uh oh I watched as he made due with what was available and got us back on the road in no time. You see, we were on the way to Kree's birthday WITH HER CAKE!!! Back on the road within minutes and arriving well ahead of the other guests, the birthday girl, her Mom and younger sister, we readied the cake. It was all good! Ohhhhh, I do hate car trouble! I feel so helpless. For me, it's an immediate call to AAA! it's always good to have a man who can take care of vehicle dilemma's. glad he got you guys back on the road quick. 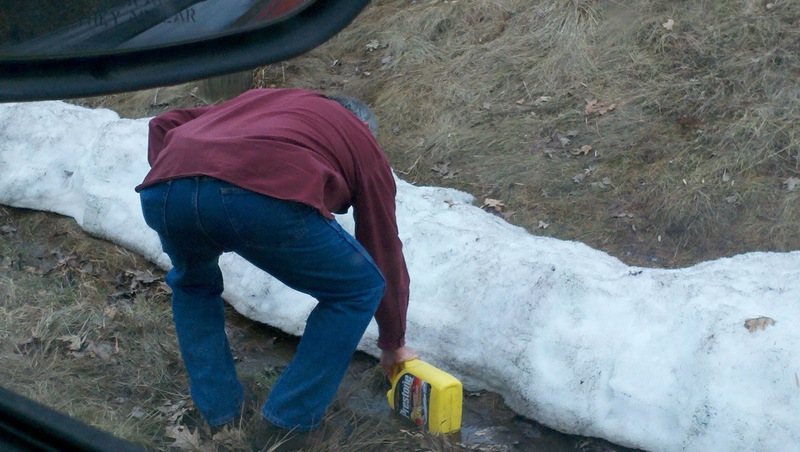 Saved by a smart man with a jug...that story could take many directions. Glad you made it safely with the cake. Glad that Joe had a quick solution...yeah snow! I'm glad you guys were able to make it to the party!